From left to right: Khamzat, the commander of the Riyad-us-Saliheen Martyr Brigade; Doku Umarov, the leader of the Caucasus Emirate; and Saifullah, the suicide bomber the deadly Jan. 24 suicide attack at Domodedovo International Airport in Moscow that killed 35 people. The leader of the al Qaeda-linked Caucasus Emirates is not thought to be among those killed in a raid yesterday by Russian security forces in the Republic of Ingushetia. Russia officials said that Doku Umarov’s body is not believed to be among those of the 17 people killed during a March 28 nighttime raid by Russian security forces on what was described as a suicide training camp for the Islamic Caucasus Emirates, in the town of Upper Alkun in Ingushetia. Three Russia commandos were also killed during the raid. Security forces are conducting DNA tests to see if Umarov was one of those killed in the attack, according to RIA Novosti. Rumors emerged earlier today in the Russian and Western press that Umarov was killed during the raid, which also included airstrikes. Emir Khamzat and Emir Supyan, two of Umarov’s top commanders, were also rumored to have been killed during the raid, according to Kavkaz Center, a propaganda arm of the Caucasus Emirate. Supyan is Umarov’s deputy, while Khazmat is the commander of the Riyad-us-Saliheen Martyr Brigade, the terror group’s suicide squad. Kavkaz Center neither confirmed nor denied the reports of the deaths of Umarov, Supyan, and Khazmat. “It is to be pointed out in this connection that the Kavkaz Center does not have any confirmed information about the possible death of Mujahideen leaders,” the terrorist media arm wrote, in a statement released on its English-language website. 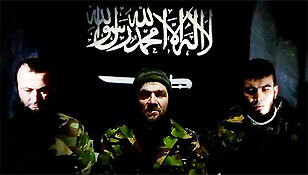 Russian security forces have been hunting Umarov and other top leaders of the Caucasus Emirates for years. Umarov and Khazmat have masterminded some of the most deadly terror attacks in Russia and the Caucasus republics. Umarov and Khazmat claimed credit for the deadly Jan. 24, 2011 suicide attack at Domodedovo International Airport in Moscow that killed 35 people and wounded scores more. Umarov also claimed responsibility for the March 29, 2010 suicide attack by two female bombers that killed 39 people in the Moscow metro. Dude probably lives in Moscow, right under their noses.